The second day from Melbourne. Go on, watch it – you know you want to. While Shane Warne added a gold lining to his script with his 700th wicket, on his home ground, and another five-wicket haul against England, Glenn McGrath was chugging along at the other end. He might have easily ended with more than a solitary scalp but, on a day of records, one of them nearly passed by unnoticed. 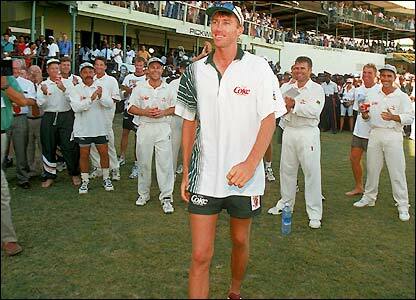 In dismissing Sajid Mahmood, McGrath claimed his 150th Test wicket against England. He has taken them at under 21 runs each and, it occured to me yesterday, I’ve seen nearly every, painful one of them. 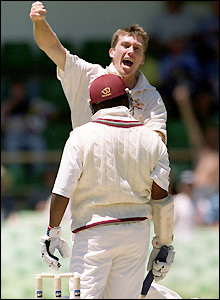 The metronome started ticking in 1994 at the Gabba but it wasn’t memorable, and few who witnessed this spindly twig could’ve forseen a future champion. 0 for 40 from 10 in the first innings; 0 for 47 off 14 in the second. His enforced half-step into the stumps on delivery seemed a clever move but awkwardly executed. He didn’t look a natural. and now a candidate for the same honour in Trinidad. Even the champions have to work hard. They always seem effortless, filled with luck and fortune but there’s blood and tears behind the smooth veneer. Anyway, he’s finished…and thank God for that! Posted massively in advance. By the time you read this, you’ll all be bursting to the seams with turkey, bread sauce and stuffing – and enough wine to sink a battleship. I’ll be heaving my way from the kitchen to the sitting room to cover the Test, so if you too are a sad loser with nothing better to do on Christmas Day than watch England get a roasting (HONK) or a stuffing (HO HO) or a basting (I’ll stop now), do join us at Cricinfo for full, live, uninterrupted, groundbreaking, turkey-laden coverage!